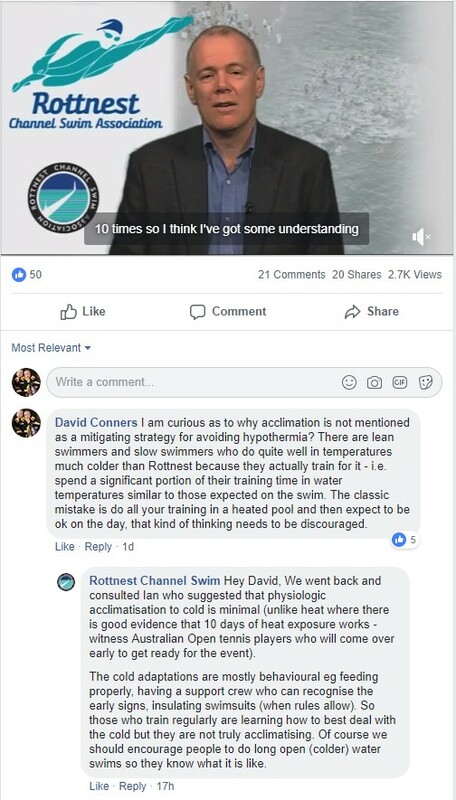 I'm not really swimming at the moment (barely surviving as a dad to 14 month old twin girls) but still have the Rottnest Channel Swim in my FB feed. He "suggested" that cold adaptations are "mostly behavioural"? Interesting and quite counter-intuitive! Does Dr. Rogers have research to support this claim? Ooh. Sounds like complete BS to me. I would like to see what research he has to back this up! Hypothermia in 70F (21C) water?!!!!!!!!! This temperature is warm! how is it possible?! I can't open the link. The event is addressed to aprx 2000 participants and some of them swim very slow. It could be the case that Australia is so warm that some people are just not mentally prepared to stay in 70f/21c water, especially if they consume energy with kicking, if they take long feed breaks or spend 12 hours instead of 6-7 others would take. People react differently to water temp and when they quit and start shiver/ mumbling, it could be easy to put it in Hypo. I also heard podcasts from the winners training mostly in the pool ..nobody complained about water temp. Quoting my Oz friend's joke after showing a pic from Europe's snowy days.. they get into hypo just looking at the pic. Oh my god, there is a qualification requirement to this event such that everyone has long-distance open water experience. I still can't believe those "experienced" marathon swimmers get into hypo in 21°C unless there is something seriously wrong with the strategy. I do not know the conditions for relays. For solo's there are aprx 300 swimmers. In total there's about 2000 swimmers. For solo's the condition is to have minimum a 10k swim. Also they accept indeed other ows's but there's no condition not to have been previously done i.e. a 27degree c water temp. since 25 February 2017 (either within the event, or in an outside of event solo crossing). February 2017. During such swim, Event Rules 5 and 6 must be adhered to. 5 and 6 must be adhered to. So there's 4hr in water for 10k in Australia, for a water avg-ing 1 degree lower than event's date. In March is even warmer. If i'm not wrong they even accept 10k's in swimming pools for internationals where winter "is coming". There are no rules about how long each swimmer has to swim on a relay. When I did Rotto in 2017 the rumor was one relay was trading off every 40 seconds. many of the faster relays comprised of low body fat members trade of every 5 minutes. Definitely a recipe for hypothermia. I on the other hand with my ample body fat overheated. to date their just isn't much research on cold water adaptation and what there is in conclusive. If the body can adapt to heat then logic would say it can adapt to cold water too. I suspect their expert Ian is no such thing when it comes to cold water. It has to be an issue at Rotto since they warn people repeatedly about hypothermia. Being dismissive of David's input is is idiotic. "Three primary patterns of cold acclimatization have been observed, a) habituation, b) metabolic adjustment, and c) insulative adjustment. Habituation is characterized by physiological adjustments in which the response is attenuated compared to an unacclimatized state. Metabolic acclimatization is characterized by an increased thermogenesis, whereas insulative acclimatization is characterized by enhancing the mechanisms that conserve body heat. The pattern of acclimatization is dependent on changes in skin and core temperature and the exposure duration." I am worried that, if the weather returns to normal next year, and I am doing my target 15 km race, if I cannot acclimatise this year, I will have only one month or even less for me to acclimatise by then in the next winter even if I can do the distance in warmer water. Is it possible to do a race at 16°C given I am acclimatised at 19°C the month before, and it only takes a month for the sea from 19°C to 16°C? Is it possible to do a race at 16°C given I am acclimatised at 19°C the month before, and it only takes a month for the sea from 19°C to 16°C? I usually have a short window for swimming between 50 F & 70 F (10 C & 21 C). Non-swimming cold adaptation has worked well for me. Especially if you acclimate to cold outside of swimming. Things like cold showers, cold/ice bath soaks, under dressing for the weather, sleeping in a cold room with the window open & light covers, and my go-to, wearing an ice vest. The weather currently is too warm, so showers are not cold even with heater off (If the weather is not warm, I will be swimming in cold water already), underdressing is not possible (I am sweating now even with minimal dressing), and the room is not cold even with the window open and lightest possible cover. Maybe I should buy an ice vest and wear it all year round, because the summer is intolerable here and I am fainting after a short walk! Basically when non-swimming cold adaption is possible in my region, swimming in cold water is also possible at the same time as well due to climate. We all know the sea temperature much depends on the weather preceding it. In the past years, there could even be more than a week when the air temperature is < 10°C, which significantly cooled down the sea, but there has been none this year, and in these 2 weeks the air temperature is consistently more than 3°C above the normal, causing the sea to warm up as well. @miklcct You have challenges getting cold! For ice baths some folks here use tubs big enough to sit in (such as animal water troughs) instead of a bath tub and add bags of ice and/or frozen water bottles. But from what you said, I doubt you have space for a trough. The first link above has info if that is doable for you, and a very good video. I love (and hate) my Cool Fat Burner ice vests. I have both types and wear them together, for 1-2 hours at a time. It's uncomfortable (hence the love/hate). The skin underneath turns bright red and I'm cold for an hour or so after taking them off. They jack my metabolism, so I can't sleep for 3 or so hours after removal. (But then, I sleep amazingly well. They should sell them as an insomnia cure.) I ALWAYS wear a t-shirt underneath to protect my skin a little. But then I put mine in a deep freezer that is colder than a freezer with a refrigerator. FYI "Phase changing" cooling vests aren't as cold (55 F - 65 F or 13 C - 18 C), but they can be regenerated by soaking their ice packs in ice water or putting them in a freezer. That type wouldn't be the same experience as a 0 F (-18 C) ice vest. But you're only trying to adapt to from 19 C to 16 C, so it might work. Though I think you'd have to be inactive (or even sleeping) when you wore it to have a noticeable impact on cold adaptation. I'm reading historical weather reports now and find out the fact to be even more terrifying!!!!!!!! On 2017-02-12, in a warm winter, the sea was 20.0°C, in 2008, on the same date after a historical cold surge, it was 13.4°C!!!!!!!! 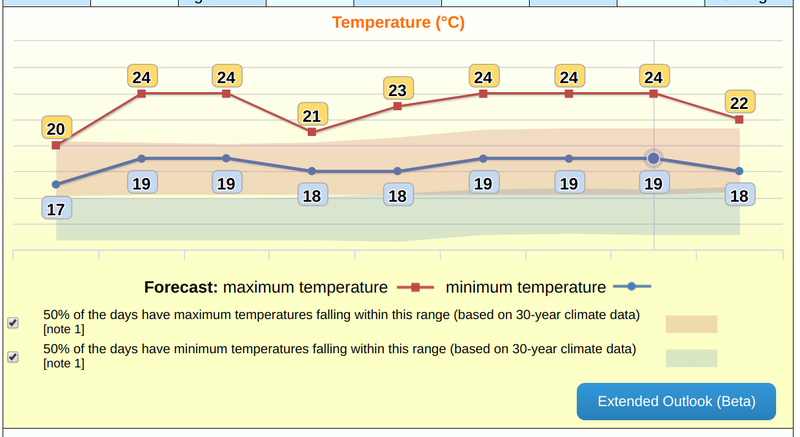 !, and in 2009, it was 19.3°C warm again. I'm afraid no that amount of training beforehand will work if there is an intense cold surge making it down from 18.7°C (where I have already been acclimated) to 13.4°C (where I have never been able to have a chance to even try it for 20 minutes in these few years) within a single f**king month (as the case in 2008) just before a marathon swimming race!!!!! We can hope for the best, but we can't prepare for the worst!!!!! One a day or two a day training?Which is more beneficial? One 2+ hour training session daily or two 1+ hour sessions?